I love the night. While the sky darkens and the sun hides its head under the horizon, reality and what really matters become clearer in my home. As a working mom, my day is filled with chaos— most days are a spit up cleaning, diaper changing, The Regular Show watching, grocery shopping, worker beeing, traffic sitting, copy machines breaking, coffee spilling, kids screaming, lesson planning, internet researching, phone texting, Facebook scrolling, dinner scrambling, dirty boy washing, loud music playing kind of day. It’s hard to see and hear and be under it all. We cuddle with our children as we settle for bed. We read stories or tell stories and above all else, we pray together. Owen and I listen to their prayers first as we close our eyes and then model other ways to pray. But sometimes their prayers are our model—pure and unadulterated, open to see what we as adults don’t see in the hubbub of the loud and distracting day. At night as Owen and I lay in bed, I’ll wake up in the stillness to feel him reach out his arm over to mine …and I know he is saying, “I’m not mad at you for that spat we had yesterday afternoon right before dinner. I love you.” And then I scoot over closer to him and make sure that at least one part of my body is touching his thereafter–a foot, a hand, a leg. The humble truth comes out at night. None of the chaos matters. You matter. We matter. God matters. At night-time, we talk about our day, we ask for advise, share our fears, our laughter, our conquests and need for growth. We have time to be still at night. To breathe in deeply and know we are here and we have a purpose and we are blessed. That God is here with us. That we are each others’ biggest fans. 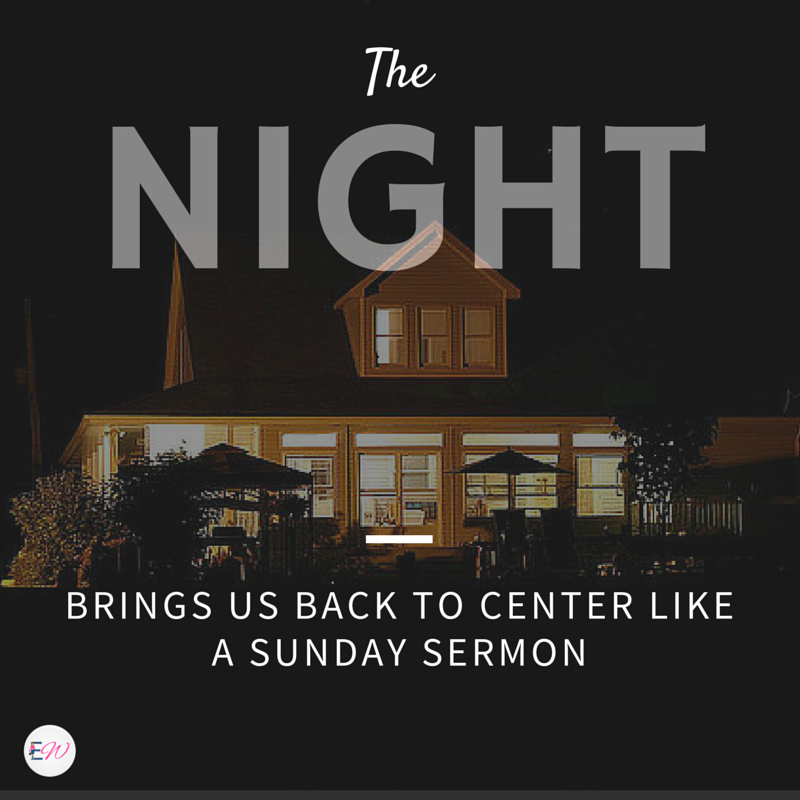 Night brings us back to center like a Sunday sermon, giving us the strength to make it through the next day.